This was released nearly a year after their debut 1978 single "Being Boiled / Circus of Death" and before their first album- "Reproduction". This would be the 'previous incarnation', before the two young ladies joined the ranks and before producer Martin Rushent (known for his sterling work on the desk and spanning the likes of Gentle Giant and Buzzcocks), who duly took hold of them and fired them up the singles charts. This first League were treading quite a different path. There were articles in the UK music papers of the time (1977-78), that put them in a box with Throbbing Gristle, Cabaret Voltaire, The Residents, Pere Ubu, Ultravox and Eno amongst others and then labelled said box- "New Musick". There was some great writing that was put into print via Jon Savage and Sandy Robertson who were reporting about these "electronic garage groups" that were seeping into the UK underground over the last 18 months, even though the names that were involved were quite varied in their approaches and some of them had been operating for quite some time, the picture was not as clear as it now appears today. This first (and best!) 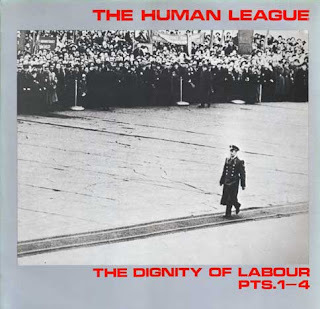 version of The Human League consisted of Martyn Ware and Ian Craig Marsh (who had previously been known as 'The Future' together with soon-to-be Clock DVA man- Adi Newton also on board) and along with crooner Phil Oakey and Projectionist / Tape Operator Adrian Wright, forged quite a dark repertoire of synth-driven ditties, although not without the odd dash of sardonic humour. Their single "Empire State Human" being a good example, new pop music with a real skewed flavour, as the backing vocals intone- "Fetch more water, fetch more sand...the biggest person....in the land"- and also with a great b-side in the track-"Introducing", that is all synthetic ambulance sirens and goon-loop synth squawks. Ware and Marsh would then split from Oakey and Wright after the second album- "Travelogue" and "Holiday 80 EP", going on to have their own chart success via Heaven 17 and concentrating on their British Electric Foundation project. It's clear from the outset, that the brains behind the early operations and this illuminating EP, were that of Ware and Marsh, that's not to say the others didn't have a say in the proceedings, but it's just that these two had been swimming in synths and electronics in the early and mid-seventies and known around their Sheffield haunts as early Roxy Music afficionados whilst honing their creative skills accordingly. Part 1 is a good example of how they set off 'synthesized sounds' but yet have that human and slightly emotional feel. A sequenced half-melody that bounces forth and gets really going as some bass synth- punches bolster the refrain which gets to sound more melodic as it gains pace. No pun intended, but the future never sounded so good, especially in the spring of 1979. Part 2 is a fantastic diamond hard, crystal cut, electronic stomper, very stripped bare and oozing in delay ricochets which then make the crystal oscillations much thicker while projecting it up there with the best of Chris Carter's sequenced synth work with Throbbing Gristle and giving Cabaret Voltaire a run for their money to boot. The remaining Parts of this decidedly odd- but yet strangely irresistable EP, consist of another stripped but driving sequence of analogue outbursts, and a piece which could be an updated out-take from Louis and Bebe Barron's 1950s OST of 'Forbidden Planet'- which, when you think of it, makes this whole record all the more bizarre. They really had tapped into early Roxy's retro-futurism and gave it their modern, updated edge. It's as if Ware and Marsh just HAD to put something contemporary and offbeat out there to fester, it's as if they wouldn't have been able to sleep, before the structured songs of the debut LP were put to the public. Journalist Paul Morley said at the time of this release, something about throwing your copy of 'Phaedra' away, as this was the real future vision in electronic music. There was also a free flexi-disc with this 12", which contained er... a group conversation about what to put on the flexi-disc! Along with tracks like the excellent "Dancevision", they were running the electro-gamut in "new musicks" without probably knowing it and just doing what was natural and letting their influences flow. They were big admirers of the Clockwork Orange soundtrack, yet they seemed to straddled the fence of commercial and underground. Also, there has been some great music from the B.E.F. camp in the form of "Music for Stowaways", which explored many avenues and routes of sound / music making, without losing their sense of humour- they were even going to call the 'Stowaways' album- "Music To Kill Your Parents By" as a skit on Eno's 'Music For Airports'! It's this EP though, with it's classic cover photo of the marching Cosmonaut Yuri Gagarin, which houses these bare-boned sequencers and eerie VCO sonatas pulsing within, that are well worth owning. Martyn Ware also had the edge on the rest of the group image-wise, as while they all looked the accepted part with the foppish post-modernist stance and 'flick-head' barnet of the time , Ware appeared on TOTP looking like a dodgy loan-shark with designer style sleazo-beard and would have been a perfect model for those large black and white photo-cards that used to grace many a barber shop wall.